We are a collective of bridal experts with several decades of experience in the bridal industry. As of this date we have over 40,000 happy brides who have trusted us with their wedding gowns. A state of the art salon with the latest contemporary architecture. Come and enjoy the latest international couture bridal designers from the most exclusive design houses in the world. We do offer consultations and recommendation on the ideal gown for you. We provide excellent customer service. Our master seamstresses are all trained in Europe and very experienced in doing couture custom made gowns, alterations, and pattern making. We promise you an excellent BRIDAL SHOPPING experience with us. 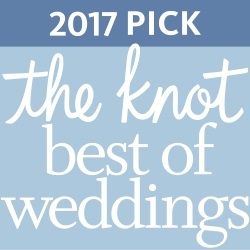 We are proud to announce that Le Marriage Couture was selected for the 2017 BEST OF THE WEDDINGS by "The Knot". In recognition of our accomplishments, we were awarded the "People Love Us on Yelp" award, which is only awarded to the most highly rated and best reviewed businesses on Yelp. We offer more than 20 bridal designers in our 6,000 square feet West Los Angeles salon making us the biggest bridal salon in California. We have 3 elegant and very spacious fitting rooms as well as comfortable sofas for your bridal party. We pride ourselves in making your bridal experience unforgettable. "I was absolutely speechless once I walked in with my maid of honor. I was in heaven!!!!! A masterpiece interior." "I was blown away by how gorgeous it was. All white tile, mirrored walls and racks and racks of all of the dresses I had been looking to try on. Not to mention the beautiful classical music that was playing in the store, I felt so special, like a bride should feel."